We all kn ow that the dog is a man's best friend. In the Western world people even managed to confirm it. 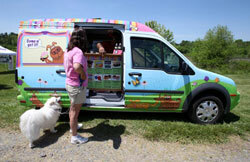 On the streets of London it is possible to see the world's first van, which carries the ice cream for our pets. The guys from the office at number K99 came up with this wonderful idea. They offer two types of cold delicacies: the Canine Cookie Crunch - these are some types of biscuits, and Dog Eat Hog World - this one has the taste of ham and chicken with a biscuit.